Are you sensitive? Many of us are. According to a study conducted by the International Society of Dermatology, more than 50% of women and nearly 40% of men identified themselves as having sensitive skin. I found a truly natural line that can help, and scored you 15% off—or win some free in our giveaway! 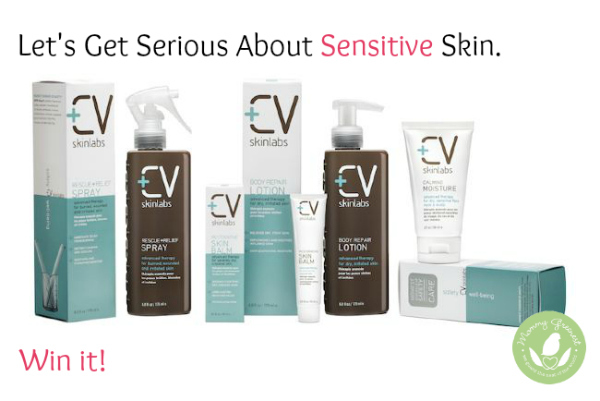 In honor of Skin Cancer Awareness Month, get 15% off on any order at CV Skinlabs. Feeling lucky? Win Rescue + Relief Spray for sensitive skin! But before we get to that, what does “sensitive skin” really mean? The American Academy of Dermatologists identifies the four distinct types of sensitive skin—acne, rosacea, burning and stinging—by what they all have in common: inflammation, which is basically swollen, warm and/or red skin. So normally resilient skin might be considered sensitive skin after a sunburn or shaving. And when you take that into consideration, I’d say 100% of us have sensitive skin at one time or another. Wouldn’t you? Britta Aragon knows about sensitive skin. A cancer survivor herself, Britta nursed her father through his eight-year battle with the disease and dedicated her work—the Cinco Vidas blog and When Cancer Hits book—to his memory. Britta saw firsthand the devastating effects that cancer and cancer treatment can have on the skin. And as she researched the chemicals in personal care products designed to treat conditions like sensitive skin, she quickly realized that some contained harsh chemicals that were doing more harm than good. So Britta set out to create CV Skinlabs, a line of non-toxic products for sensitive skin. She focused on truly natural and organic ingredients, and nixed anything with links to hormone disruption, cancer, skin irritation and allergies, among others. Naturally, there are no synthetic fragrance, parabens, hydroquinone, triclosan or other toxic chemicals in the mix. Tri-Rescue Complex, a unique blend of turmeric, reishi mushroom and alpha-bisabolol, derived from chamomile, is infused into each product in the line, and I think that might be what makes CV Skinlabs Rescue + Relief Spray so incredibly awesome. Spray on this cooling relief to soothe itchy, burning, irritated or inflamed sensitive skin. It’s perfect for guys after shaving to prevent razor burn, and an absolute essential after a day at the beach. In fact, Healing Lifestyles & Spas just named it Best After-Sun Smoother in their 2014 Earth Day Beauty Awards! In honor of May Skin Cancer Awareness Month, now through 5.19 use “mommygreenest” and get 15% off any order at CV Skinlabs. Feeling lucky? Win some Rescue + Relief for yourself! This post was sponsored by CV Skinlabs and meets the standards I’ve established to endorse a brand as “Mommy Greenest Approved.” Click here for more about Editorial Standards. ← Is Your Flower Delivery Service Toxic? Approved: CV Skinlabs for Sensitive Skin – Mommy Greenest <Liked it! I would love win & share this with my husband… male grooming is just as popular… together we can make a difference! I would love to win this. It sounds like a very healthy way to treat my sensitive and rosacea prone skin!